It was purchased by Hicks & Lawrence, a St. Thomas, Ontario company specializing in crop dusting, fire fighting and fighting budworm as a training aircraft for pilots of the massive Grumman Avenger. RWN was sold in 1978 to George Gilvesy of Tillsonburg, who built a hangar to house the plane (CHAA now owns this hangar). It was later purchased by Dr. Don Nightingale, a professor at Queen’s University in Kingston as a flying memorial to his father who received his wings at No. 6 SFTS in Dunnville, Ontario and instructed at No. 9 Elementary Flying Training School (EFTS) in St. Catharines, Ontario. 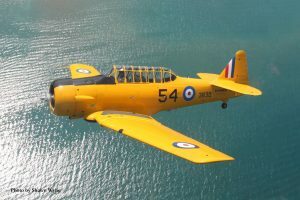 Bill Hayes of Tillsonburg spared no expense and RWN was restored as an authentic Harvard Mk II. Upon CHAA’s “Class B” Museum designation, the aircraft was donated to CHAA in honour of Nightingale’s father. In 1997, RWN returned to Tillsonburg.